By James K. Kirchner, O.D. 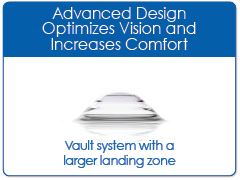 For both UltraHealth and Clearkone, the fit (apical clearance) is determined for both lenses using a vault system. But the biggest difference between the two lens types, beyond the material composition, is the use of the skirts. With ClearKone the fit is determined by changing the vault and the hema skirt. The skirt plays a major role in lifting the lens off the cornea. The hema skirt is effectively able to hold up the RGP portion of the lens, providing additional vault. As a result, the majority of ClearKone lenses are fit with a medium or a steep skirt. In the case of the UltraHealth skirt, virtually the opposite is true. UltraHealth fitting starts with a flat skirt. Let me explain why. The primary purpose of the skirt in UltraHealth is to provide good centration and movement for the GP, not to hold it up. Unlike a hema skirt, the new SiHy material is not capable of elevating the GP lens for more than 20 or 30 minutes. Therefore, if you use a steeper skirt during the diagnostic fitting to clear the apex of the cornea, rather than increasing the vault, after about 30 minutes, the lens settles back down and the GP may be resting heavily on the cornea in combination with the steeper skirt causing a tight fit. We've found that people that are having trouble with eventual clearance are inappropriately using the medium or even steep skirts to lift the lens off the cornea during the fitting process. The result will be heavy bearing of the GP at its landing zone, causing, in some cases, corneal staining in conjunction with a decrease in lens movement and tear exchange. Most importantly, the enormous advantage of the new UltraHealth skirt design is the addition of a unique landing zone, immediately outside the junction, which distributes the lens burden across a larger corneal area. This results in a much more comfortable lens with superior tear exchange characteristics for a more healthy fit. In order for the landing zone to be effective and the tear exchange optimized, the skirt needs to be as flat as possible to truly utilize this enhancement. This allows the inner landing zone and the outer landing zone to work together as a team, dramatically increasing the success for a broader range of irregular cornea patients.